* PROVENANCE: This oil painting was purchased from Linda Grimm’s Horse Museum. Linda Grimm acquired this painting from Nick Morris Davis the only grandson of George Ford Morris. Nick inherited this painting from his mother Patricia Morris Davis the only daughter of GFM. Patricia Morris inherited this painting from her father George Ford Morris. 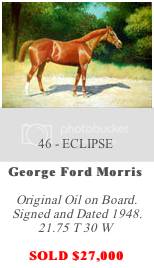 In short, this GFM beautiful horse oil painting is from the estate of George Ford Morris' own personal collection. American born 1873 Joseph, Missouri died in 1960 Arcadia, California. George Ford Morris was the foremost American equestrian artist of his time. He documented the fast changing world of the horse in American history in the early to mid 20th century. He was equally talented as a painter, sculptor, illustrator & lithographer. He was mainly self taught but attended classes at the Art Institute of Chicago in 1888 & later at the Academie Julien in Paris 1925. In the early twentieth century, Morris worked mainly from his Thirty-third Street studio in New York City. Concentrating almost solely upon the art of the horse, George Ford Morris was a frequent contributing artist to such publications as 'The American Horseman', 'Breeder's Gazette', 'American Field', 'National Horseman' & 'Thoroughbred of California'. He also illustrated for national publications such as 'Scribner's' & 'Century' magazines. Horse Study was commissioned by the Associated American Artists of New York in 1945. The Associated American Artists was created in the mid 1930s & commissioned original graphic art from such great American masters as Grant Wood, Thomas Hart Benton, Reginald Marsh & many others. Besides Horse Study, Morris published at least two other original lithographs with the A.A.A. during the 1940s decade. All A.A.A. works of art were published in editions ranging from 125 to 250 signed impressions. 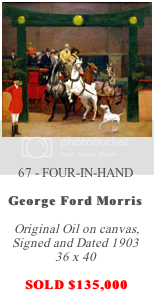 In 1952 Morris published 'Portraitures of Horses' considered The Horse Book of the Century. An amazing collection of his portraitures & sketches spanning over 40 years of his work. Needless to say these books have become high collectibles in the horse world. The pages are full of images of top Saddlebreds, Arabians, Show Hacks, GFM's own horses, pet dogs & more, creating a chronicle album of Town & Country Americana. George Ford Morris is most remembered for his portraiture of the American Saddlebred. His documentation of the rise of this breed with its foundation stock is quite remarkable. George Ford Morris' work remains the most sought after still in the 21st century. 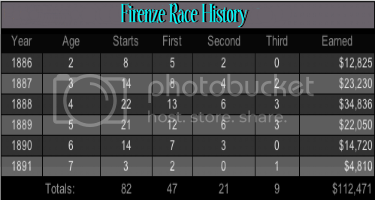 Firenze 1884–1902, also recorded as "Firenzi,", was an American Thoroughbred Champion & Hall of Fame filly racehorse. The New York Times called Firenze: "...one of the greatest distaffers of the 19th Century." Foaled at Elmendorf Farm in Lexington, Kentucky, Firenze was sold by owner/breeder Daniel Swigert to lawyer & businessman James Ben Ali Haggin. Under trainer Matt Byrnes, Firenze became the second filly in American Thoroughbred racing history to earn more than $100,000 in purse money & was voted the retrospective American Champion Older Female Horse for four straight years. Although a small horse at just 15 hands, Firenze was noted for her stamina. She competed in up to twenty or more races a year & frequently at distances of 1 to 2 miles. However, what makes her performances so remarkable is that she repeatedly defeated the top colts of the day including the Dwyer Brothers Stable's two future Hall of Fame colts, Hanover & Kingston. As well, in the 1888 season, she was the only horse to beat A. J. Cassatt's Preakness Stakes winner & son of the great Longfellow, The Bard. Firenze won the mile & a half Freehold Stakes three straight years between 1888 & 1890. Run at the Long Branch Racetrack in New Jersey, Firenze was so feared that in the 1889 no owner would enter their horse against her & she won in a walkover. At her retirement Firenze had achieved the second highest earnings for a filly in American history. Miss Woodford won more & Yo Tambien won a bit less. 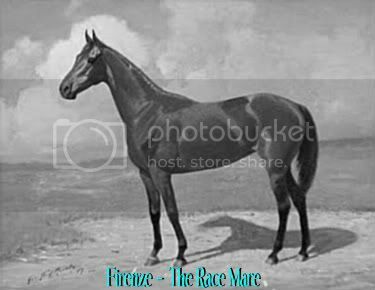 Firenze began racing at age two & competed through age seven, retiring to her owner's Rancho Del Paso stud farm near Sacramento California. As a broodmare her own progeny, including those sired by her Hall of Fame stablemate Salvator achieved only modest success in racing but several of her fillies were successful as broodmares. Firenze died in 1902 at Rancho Del Paso. In 1981, she was inducted into the National Museum of Racing & Hall of Fame. This beautiful oil painting 'Firenze The Race Mare' is extremely valuable because it was not only painted by GFM but it was part of George Ford Morris' own personal art collection. VERY RARE INDEED!!! 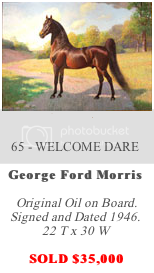 The George Ford Morris Firenze ~ The Race Mare painting pictured on this post is part of our personal Cool Collectibles Collection & can be purchased in our eBay Store. 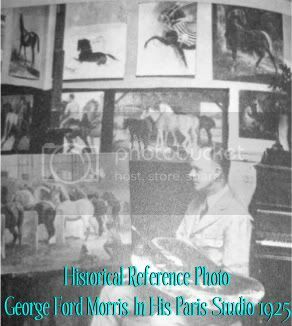 For more information & PICs of this GFM gorgeous horse oil painting & other COOL COLLECTIBLES click above. Amazing painting by one of the world's best equestrian artists. Wow! 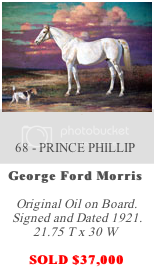 OMG, I love George Ford Morris horse paintings. Did you sell all those horse paintings at auction? 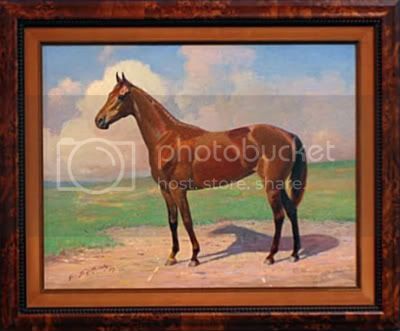 Or are you just selling the one oil painting of Firenze The Race Mare? WISH I COULD WIN THE LOTTERY! I always wanted a real art work from a real artist that's in the history books of the most fabulous horse artists. Plus this painting was from his own personal art collection. Sorry you have to sell your precious painting. Someone will be very lucky to have purchased this beautiful work of art from you someday, I can dream. You have a wonderful wealth of information on your posts. P.S. Do you have other original GFM pieces that you might be selling? Hi Jessica, thank you for your enthusiasm. You made my day with your sweet & caring comments. Yes, it breaks my heart that I have to sell my gorgeous GFM Firenze The Race Mare oil painting. 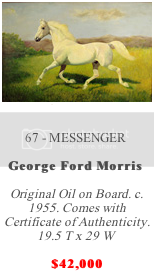 The other GFM horse paintings represented on my post were not mine but they are the results sourced from Artnet & other auction house Databases to help show what original GFM paintings have sold for. Yes Again, I will be adding more GFM art work to my auctions later in the new year. But nothing like the Firenze which is an oil painting. I have GFM hand signed lithos & similar art work plus original sketches from his estate with COAs or LOAs included. Thanks for stopping by today with your sweet comment. I've been having periodic email issues so I'm not surprised to hear you didn't receive my reply. I did receive your Monster postcard and it is nostalgically charming. Brings back some fun childhood memories. Thanks again Lyndy. May your holidays be filled with love and laughter. Ditto Melissa, thanks for your sweet comment too. Hope your New Year is filled with Love, Joy, Fabulous Health & Wealth!! !